Education: Bachelors Degree in Biology from Bowling Green State University. Bachelors Degree in Human Biology from The National University of Health Sciences in Chicago. Doctor of Chiropractic from The National University of Health Sciences. Provider's focus: Spinal Care, Muscle Therapy and Weight Loss. 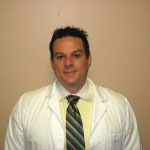 Hobbies: Dr. Wagner enjoys reading, working out and being involved in community activities.